Making Thinking and Learning Visible (Digital Version!) ~ No Limits on Learning! 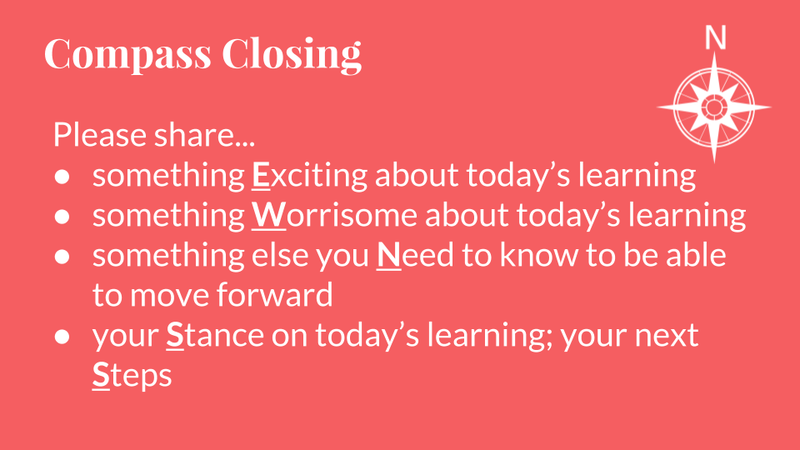 Whether teaching students or adults, I often feel like I'm rushed at the end of a class, and I know the students (adults) are ready to leave...so I often drop the closing activity (or rush through it with little time for processing.) I think a final summary, reflection, or share out is extremely important, so I hope by creating some of these electronic versions of the thinking routines, I won't have an excuse to skip the finale! I tried this thinking routine in a recent session, and I had participants collaborate to create a headline for the day's experience. The description from Project Zero states, "If you were to write a headline for this topic or issue right now that captured the most important aspect that should be remembered, what would that headline be?" 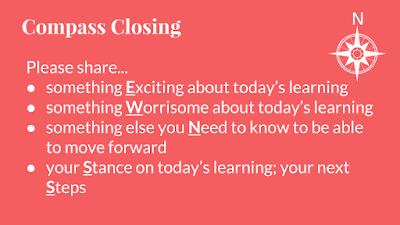 I added a tech twist by asking the participants to use the ClassTools Breaking News Generator to quickly post their headline, and because of time (arrghh!) we didn't quite finish, but I got a few responses via Twitter. Here's another quick headline example, and I just right-clicked to save the image. By the way, the ClassTools site has a lot of quick, easy resources, such as random name generators, "fake-book," and graphic organizers, and you do not need a login or account. An easier way to collect a headline would be with a Google Form. Use data validation to limit the number of characters in the response. One other routine I often use is a Compass Closing. I think the questions are great reflection questions, but by the end of the day, I'm usually happy if I can get 1 response for each prompt. If you want students to have personal, individual responses, a Google Doc or Form allows you to collect all of the responses, although the benefit of a Google Form is that all responses are on one spreadsheet. I keep finding great uses for the Padlet shelf option, and this thinking routine is another perfect fit. If you want the students to see other responses, which is often very beneficial, posting and allowing comments on Padlet might be the way to go. With the technology twist, everyone participates, and even the quietest student has a voice! In addition, I now have another formative assessment and can make instructional decisions based on students' responses. I finally invested in Making Thinking Visible (Ron Ritchhart, Mark Church, Karin Morrison) and I cannot wait to really dig into the research and routines. The mission of the book, "not only learning to think but thinking to learn," is exactly what's on my mind lately, and I also love how the authors really debrief and troubleshoot the core of these routines. Any other favorite thinking routines? Do you think the technology helps or hinders the process?